Over the past twenty years, Americans have been fed a mash of confusing financial and economic information. Economist Ellen Frank’s alternately enlightening and shocking volume shows us how what we’ve been taught to think about stocks, interest rates, personal opportunities, employment, government spending, inflation, and the like distorts popular understanding of how the economy really operates. But public confusion serves a distinct political goal: to camouflage the transformation of economic policy from a tool for improving the living standards of all to a tool for securing privileges for the wealthy. Sifting through confusing rhetoric on everything from the stock market to 401(k) the global financial system, Frank reveals how we came to be so misinformed and lays out in clear and engaging prose the basis of real wealth and economic well-being. deliberate use of economic jargon to confuse and mislead. In The Raw Deal she shows how concepts such as inflation, deficits, saving and productivity have come to serve as weapons of mass distraction, obstructing debate over vital concerns such as full employment and high wages. This lucid, accessible book is a great corrective; everyone should read it." "Ellen Frank is a dangerous character: a serious economist who writes clearly and cares about social justice. 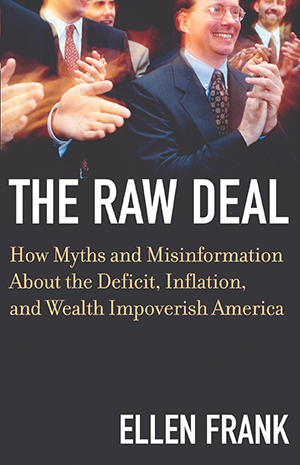 The Raw Deal is an engaging and passionate attack on the right-wing nostrums that have passed for economic wisdom in the U.S. over the past generation."